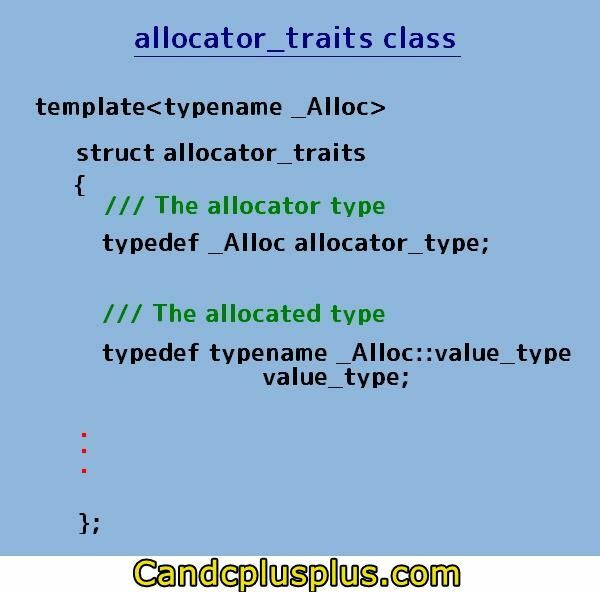 The C++11 allocator_traits is a class template that provide features to handle the allocator class object (if you don’t know what is allocator class go to this link C++11 allocator). This class will accept allocator class as the template argument type and it defines most of the member functions of the allocator class. Instead of using the member functions of the allocator class we can use the functions provided by this class to perform an operations. The member functions of this type are given below. Below we will see how to use these functions in our program. The allocate() function callocate memory for the allocatro object. This function accept two arguments. The first argument is the allocator object and the second is the size of the memory to be allocated. The allocator_traits allocate() function calls the allocate() function of the allocator class object.The allocator_traits allocate() function will look like this. Note the function is a static function. This function will accept three arguments: the first argument is the allocator object, the second is the pointer to the memory and the third is the size of the array element. 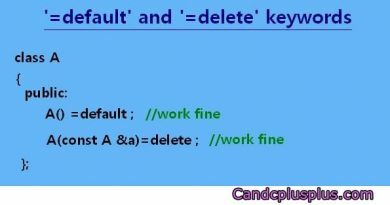 The purpose of this function is to deallocate the memory. This function also calls the deallocate() function of the allocator class using the allocator object supplied as the parameter. Note this function also is a static type. The purpose of this function is to initialize the memory. The function will accept three arguments: the first argument is the allocator object, the second is the pointer to the memory and the third is the initializer. The function purpose is to call the destructor of the object. The function accept two arguments: the allocator object and the pointer to the memory. The destroy() function of allocator_traits calls the destroy() function of the allocator class. The destroy() function will look like this. The allocator_traits max_size() function like the allocator max_size() function returns the maximum memory size the class can allocate. This function will return an allocator object. The allocator object returned is either the object returned by calling the function select_on_container_copy_construction() of the allocator object passed to the function or it simply returns the allocator object that is passed (as argument) to the function. This function will look like this. How to use this function is shown below. In the allocator class there is a rebind member type whose syntax is allocator<type>::rebind<type>::other. This function helps us to create an allocator object of different type from the specified type.Consider the code below. We obtain a string type allocator ‘stAl’ from the ‘al’ int type allocator. There exist member type like rebind of allocator in allocator_traits class whose function is exactly the same. How to use this member type is shown below.